Last weekend I turned 30 (old lady now…) so we thought we would do a beach party on Saturday to celebrate. So of course I wanted to make some nutritious and delicious food to bring. I had to think of something I could keep cold in a cooler and that would be refreshing and not too messy or complicated. 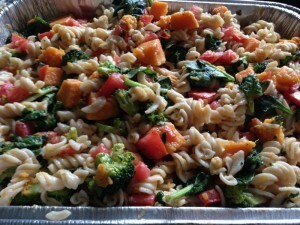 Pasta salad seemed to be an easy solution…so my recipe for sweet potato pasta salad was born! 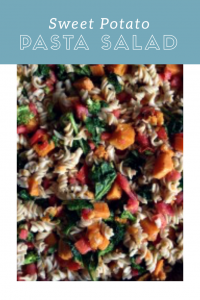 I used whole grains (good carbs for sustained energy and fiber), olive oil (good fat, anti-inflammatory properties), and fresh veggies (lots of antioxidants, vitamins and minerals). I was able to keep it in a large aluminum tray in the cooler and it did stay cool until we were ready to eat. 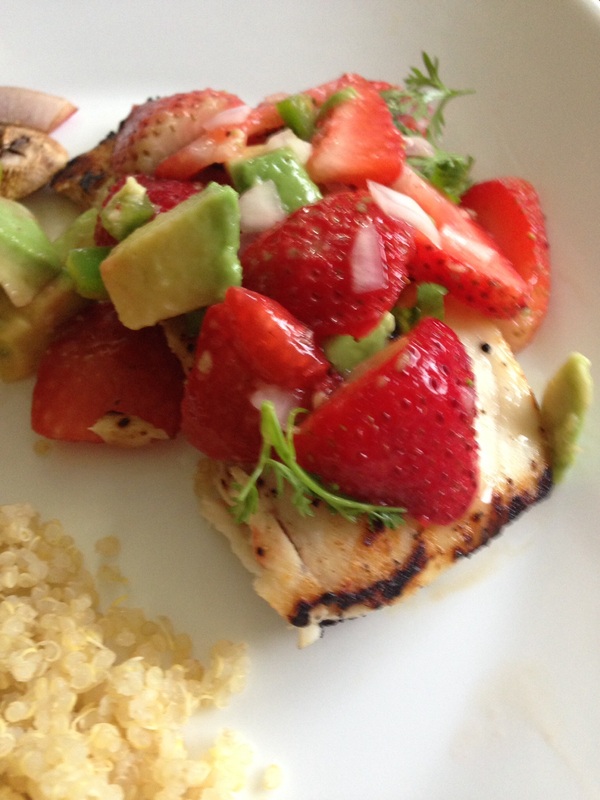 I also made a fruit salad to bring because it is super easy to just chop up some melons, grapes and strawberries….and who doesn’t love cool, fresh fruit on a hot day? Plus…it is good for you. My pasta salad turned out really delicious fed about 16-20 people so keep that in mind when you see the large amounts of ingredients. Cook pasta according to package directions in a very large pot. While pasta is cooking, clean off sweet potatoes and poke several holes through the skin with a fork. Microwave on high for 10 minutes or until sweet potatoes are cooked through. 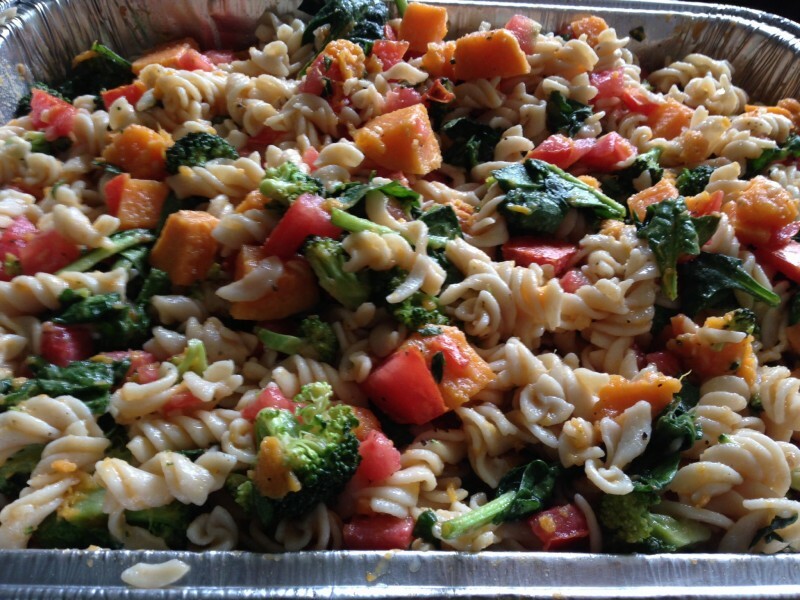 Rinse broccoli and tomatoes and start chopping into pieces while sweet potatoes and pasta are cooking. Remove sweet potatoes (be careful they will be very hot) and let cool. Put chopped broccoli in the microwave on a microwave safe plate on high for 2 minutes…but only if you are like me and prefer your broccoli to be slightly cooked but still firm and crunchy. If you prefer it raw you can skip that step. By now your pasta should be done cooking; drain and rinse with cold water to prevent sticking and add to your aluminum tray or serving dish. Add the bag of spinach to the warm pot you just removed the pasta from and put back on burner on low heat stirring occasionally to warm and wilt spinach until it shrinks to about half. 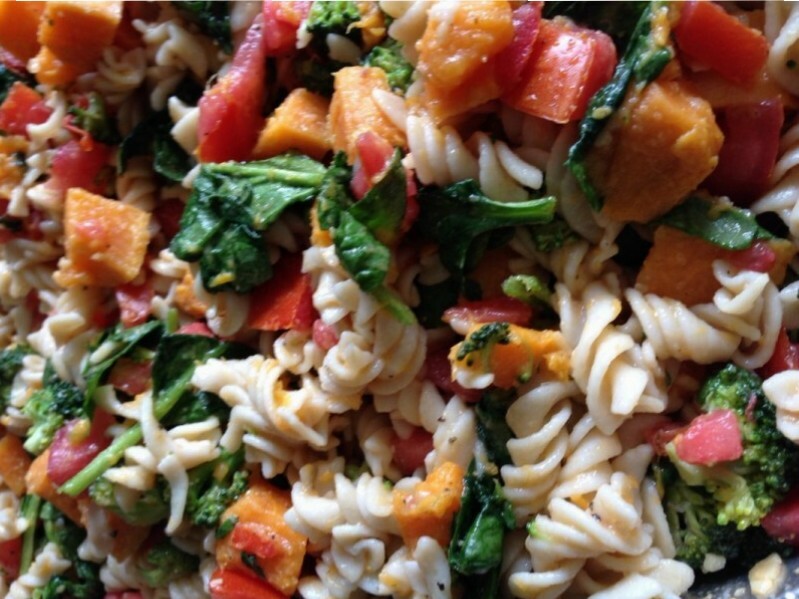 Add warm spinach, broccoli, and tomatoes to pasta. If your sweet potatoes are cool enough, peel off the skin and chop into bite size squares. If they still feel hot please be patient and let them cool down more… you can get burned by hot potato steam. The potatoes should peel very easily with a knife now that they are cooked. 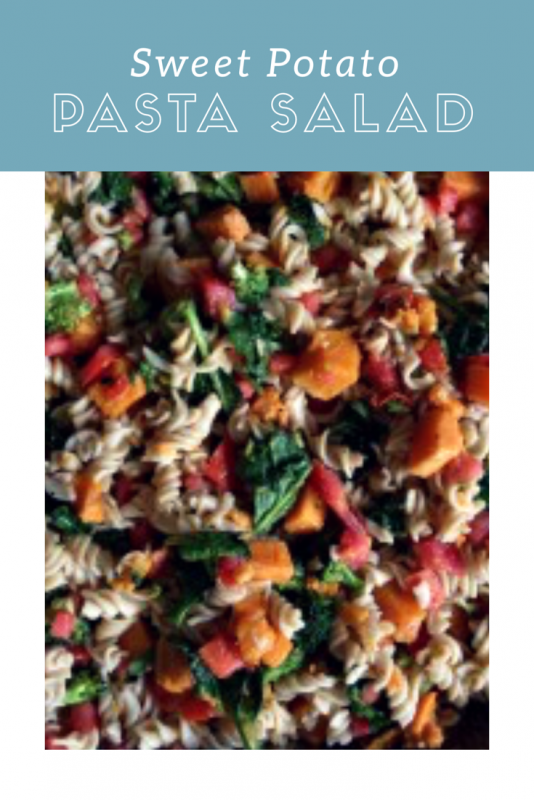 Add the sweet potato pieces to the pasta mixture. Mix together the olive oil, vinegar, lemon juice, garlic, salt and sugar in a small bowl and pour over pasta. Mix well and add ground black pepper to taste. Refrigerate until ready to eat, can be made the day before. I paired it with balsamic grilled vegetables (peppers, onions, mushrooms and eggplants) and quinoa. Sorry I wasn’t able to post last week but I was in Puerto Rico for a friends 30th birthday so I was busy doing beach things and exploring the island. Before I left I did make a really good spaghetti squash dish that I thought I could share today. It was my first experience working with spaghetti squash so I was surprised how easy and quick it was to make. I wish I had tried it sooner! 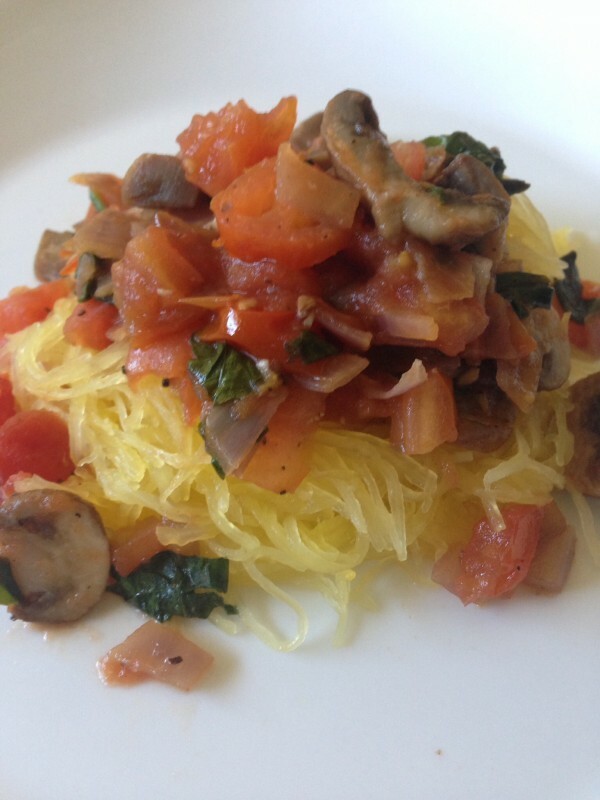 Spaghetti squash contains many important vitamins and minerals such as potassium, vitamin c, vitamin a, and dietary fiber. It also is lower in calories than traditional spaghetti noodles so it can help with weight loss when substituted. Rinse off spaghetti squash and poke several holes with a knife to allow steam to escape while cooking. Microwave spaghetti squash on high for 15 minutes. If your microwave doesn’t rotate make sure you turn about half way through cooking to ensure it is cooked evenly. Remove squash from microwave when finished cooking but do not attempt to cut it open yet. It will be very hot and needs to cool down for several minutes. Heat olive oil in a medium sauté pan on medium heat and add garlic and onions. Cook until onions appear translucent. Add mushrooms and tomatoes and cook for several minutes longer until vegetables are warm and mushrooms are soft and decreased in size. Mix in basil and oregano and cook for 1-2 more minutes to blend the flavors. Turn off heat and add a dash of salt and pepper if desired. 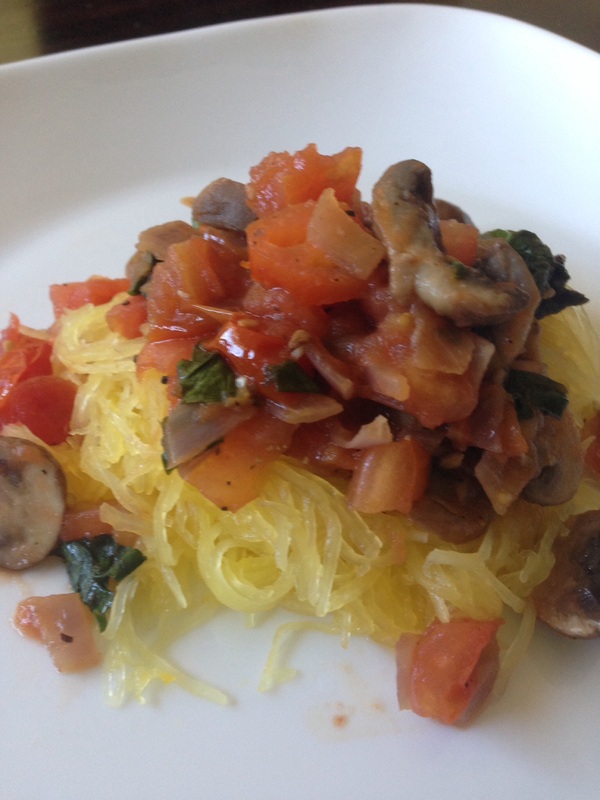 Cut open spaghetti squash in half lengthwise if cool enough and remove seeds. Use a fork to scrape out strands and put each half on a plate. Top with sauce and serve.